Water protection areas (WPA) comprise approximately 17% of the territory of Slovenia. Going by land use in these areas, forest (61.1%) prevails, followed by grassland (13.6%) and arable fields (10.9%). Ecologically farmed land represents only 1.7% of total WPAs and 6.04% of agricultural land on WPAs, with grassland representing the largest share at 79.6%. Changes in land use on water protection areas in the period 2009–2014 were relatively few, with the greatest differences within this period being observed in the increased area of land under the process of overgrowing , which indicates a positive trend from the perspective of the impact of human activities on waters within WPAs. The indicator shows the structure and surface area of land use in water protection areas (WPA) in Slovenia and gives the comparison of land use change between 2009 and 2014. The land use data are clustered into 9 categories; surface area of arable fields, permanent crops, grassland, land under natural forest regrowth, forest, built-up land, wetland, open land and waters are presented for the years 2009 and 2014. 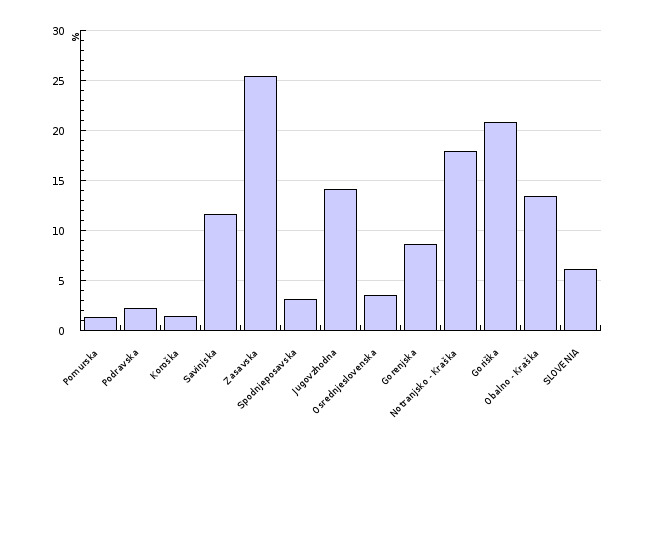 The percentage of the aforementioned categories within WPA is also presented. 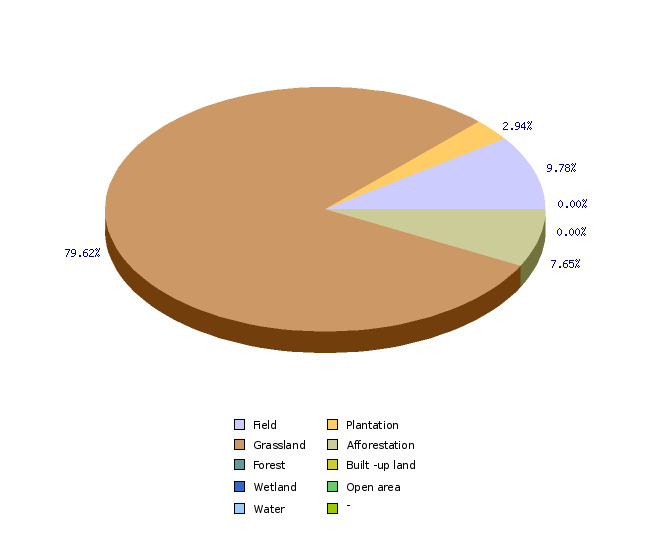 The indicator also shows the percentage and surface area of ecologically cultivated land within WPAs (in 2013). - To reduce or prevent potentially negative impacts of agricultural activity on the quality of waters, including by increasing the share of ecologically cultivated agricultural land within WPAs. In Slovenia, the total surface area of water protection areas is 347,878.8 hectares, which represents approximately 17% of the entire territory. In terms of surface area, the share of ecologically cultivated land within WPAs is very small. It occupies only 1.7% of WPAs with grassland being the most common land use category, covering 79.6% of ecologically cultivated land within WPAs. 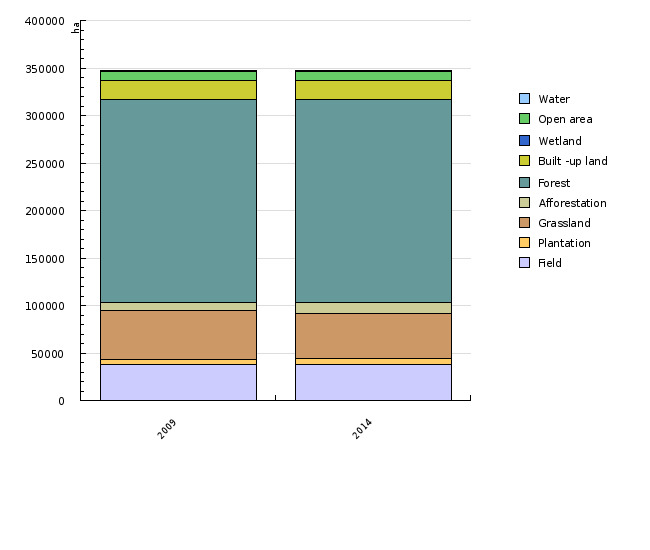 Land use changes within WPAs in the period 2009–2014 are rather insignificant. The greatest change occurred in the category of land under natural forest regrowth, which increased by 35%, but even this change is small in terms of surface area, as the size of this land use category within WPAs increased from 7,505 to 11,552.3 hectares. Changes in all other land use categories were smaller, with an increase/decrease of less than 10% in the period 2009–2014. An increase in surface area of water (4.3%), permanent crops (3,7%), open land (2.89%), built-up land (2.5%), wetlands (0.5%) and arable fields (0.4%) was recorded, while a decrease was recorded in the land use categories of grassland (8.9%) and forest (0.5%). A relatively large increase of areas under the process of natural forest regrowth and a small increase of built-up areas within WPAs can be characterised as a desirable phenomenon or a positive change from the perspective of water pollution. Anthropogenic impacts (e.g. consumption of pesticides and mineral fertilisers) in areas under the process of natural forest regrowth are considerably lower than on e.g. arable fields. From the perspective of preservation of cultural landscape within WPAs, a 35% increase in the share of agricultural land under the process of natural forest regrowth cannot be considered to be favourable. An increase in the area of built-up land is an issue that raises concerns, as land take permanently changes the conditions within WPAs. Considering the desirable course of development, the trend of land use change within WPAs in Slovenia is still indefinable. 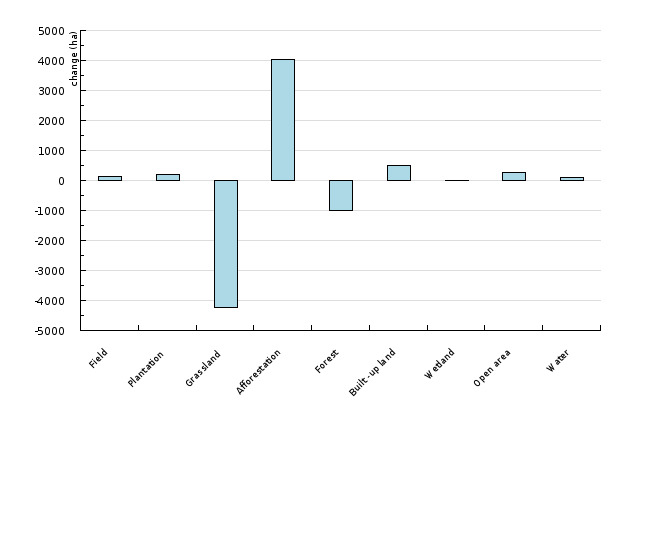 Although land under extensive use (natural forest regrowth) has been expanding within WPAs, a reduction of areas with arable fields and permanent crops (in the period 2009–2014 there was a stagnation or even a slight increase in the area of these two categories) should be encouraged. Namely, arable fields and permanent crops are characterised by the most intensive use of pesticides, mineral fertilisers and machinery, which results in increased levels of environmental pollution (water). In the future, intensity of agricultural use within WPAs will need to be monitored and, where possible, restricted. This will be facilitated by analysis of the share of ecologically cultivated agricultural land within WPAs. In December 2013, the share was relatively modest, representing only 1.7% of the total WPA land area, while in the structure of agricultural land, the share of ecologically cultivated land represented only 6.4%, which is even less than its share in the entire territory of Slovenia (8.4%). Ecologically cultivated land is mostly covered with grassland (79%), followed by arable fields, areas under natural forest regrowth and permanent crops. Considering the need to protect drinking water sources, a greater percentage of ecological farming within WPAs would be expected. As this was the first analysis of ecologically cultivated land within WPAs, the trend development cannot be discussed properly. An overview of statistical regions shows an interesting picture. Water protection areas cover the largest surface area in the Podravje statistical region (over 70,000 ha), which represents 18.1% of water protection areas in Slovenia. Within the Podravje region WPAs, forests prevail, followed by arable fields. An exception in Slovenia is the Pomurje statistical region, where arable fields prevail within WPAs (approximately 50% of the total WPA area), while forest is the second largest land use category. From the perspective of environmental safety, this is not a favourable situation, as arable fields are great potential polluters through pesticides and fertilisers. In total surface area of WPAs, the Podravje region is followed by the Central Slovenia region, with approximately 50,000 ha, representing 13.4% of Slovenia's WPAs. Forests prevail here, also. The percentage of ecologically cultivated land within WPAS is highest in the Obala-Kras and Gorica regions, with 1,227 and 990 ha, respectively. WPAs of the Obala-Kras and the Gorica regions comprise 21% and 16.9%, respectively, of all ecologically cultivated land in Slovenia. 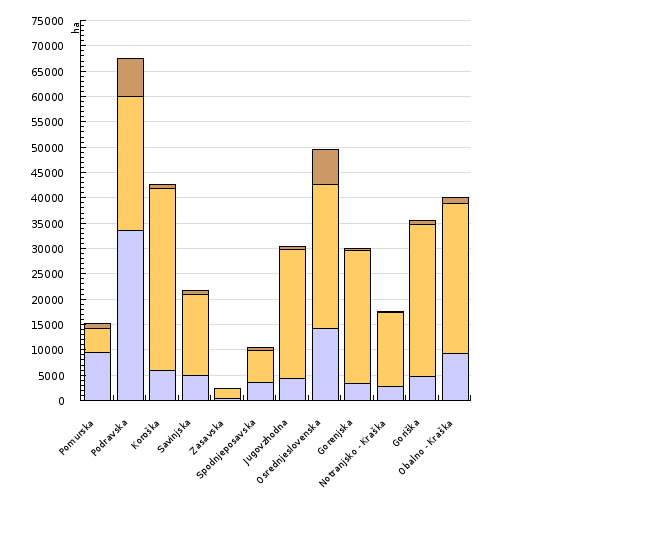 The data on the share of ecologically cultivated agricultural land in the total area of agricultural land within WPAs by statistical region is also important. This share is the greatest (25%) in the Zasavje region, followed by the Gorica region (19.4%) and the Notranjska-Kras region (17.3%). The smallest share was recorded in the Pomurje and Koroška regions (below 2%). The comparison between statistical regions with regard to land use within WPAs in 2009 and 2014 shows no significant changes. In most cases, the surface area of forests and grassland slightly decreased, while the greatest positive change was recorded in the category of land under natural forest regrowth. From the perspective of protection of water protection areas, this can be positive, as areas under the process of natural forest regrowth are less intensely cultivated than grassland, while on the other hand, forests have a positive impact on the self-purifying capacity of the environment. Other land use categories have been changing differently from region to region, but the changes are insignificant. A potential problem is the increasing size of built-up areas – in the Pomurje, Podravje and Central Slovenia regions, their surface area increased by more than 500 hectares. Drinking water as a natural resource has remained an important topic of various debates in recent years and is doubtlessly one of the priorities of environmental policy, while intensive use of soil for agricultural purposes, intensive irrigation or fertilisation, inappropriate machinery or unprofessional wastewater disposal cause water pollution and deterioration of its quality. In order to ensure water quality, management of burdens and driving forces of such burdens in the immediate vicinity of water sources is necessary. The analysis of land use structure and monitoring of changes show anthropogenic impacts in these sensitive areas. Legislation trends in this field are moving toward reduction in the surface area of arable fields and built-up land within WPAs and an increase in the share of ecologically cultivated agricultural land. In the future, halting of urbanisation and agriculture expansion is to be expected, especially in areas with the strictest water protection regime. Namely, legislation adopted by the Government of the Republic of Slovenia since 2004 on the basis of the Water Act has been very strict, particularly in the field of construction and pollution. Further legislative regulations will be aimed at farming in the areas with the strictest water protection regimes in order to help them become more ecological.